RETAINING its inherent character this property has been tastefully brought into the 21st century with modern luxury and style. 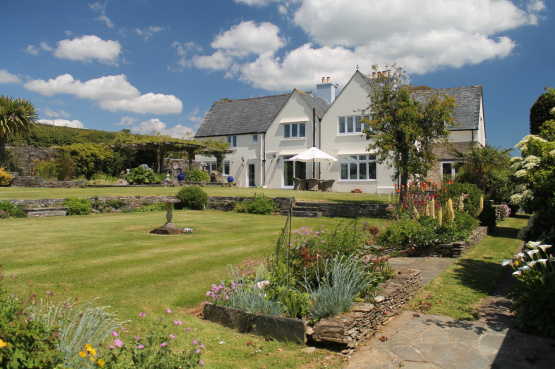 The Croft is in an idyllic location just a mile inland from picturesque South Milton Sands, which is owned by the National Trust, and has beautiful views across its own tranquil landscaped gardens towards the sea. The property has four en-suite bedrooms and an extensive cellar plus an attractive detached annexe with two en-suite bedrooms. Entered through an arched timber door with a slated porch, the impressive reception hall has a sweeping feature staircase and oak flooring which flows through into the elegant, airy drawing room and sitting room, each of which has French doors into the garden and attractive fireplaces, the former with a wood-burning stove. Comprehensively fitted, the spacious kitchen/diner is divided by a smart gas-fired wood effect stove. The extensive cupboards are topped by granite work surfaces and feature a range cooker, space for an American fridge/freezer, a central island, twin Belfast sinks and other integral appliances. There is a separate fitted utility room and cloakroom. Upstairs the sumptuous master suite has a walk-in wardrobe, bathroom with double shower cubicle and free-standing bath and views to the coast. The second bedroom has a part-vaulted ceiling and en-suite shower and another walk-in wardrobe and both the other bedrooms are en suite and have built-in storage. The timber annexe is arranged over two floors with a double en-suite bedroom and living area on each level and a well fitted kitchen. Attractively landscaped grounds provide a variety of secluded seating areas from which to enjoy the rural outlook including a patio with a pergola entwined with a vine and climbing roses and a fish pond enhanced by mature wisteria. There is also a small orchard, a lawn and plenty of parking and storage as well as a stable and greenhouse. With a guide price of £1,500,000 The Croft is only a short drive from Thurlestone, Kingsbridge, and Plymouth and is on the market with Marchand Petit’s Prime Waterfront & Country House Department (01548 857588).